Huckle Cat, Lowly Worm, and Goldbug guide children on a point-and-learn journey through the words around them. 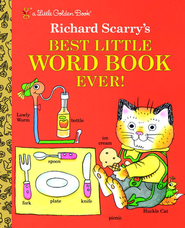 Richard Scarry is one of the world's best-loved children's authors EVER! Generations of children all over the world have grown up spending hours poring over his books filled with all the colorful details of their daily lives. No other illustrator has shown such a lively interest in the words and concepts of early childhood. For himself, whenever he was asked how old he was, Scarry would always put up one hand and laugh, saying, "five!" Born in 1919, Richard Scarry was raised and educated in Boston, Massachusetts. After five years of drawing maps and designing graphics for the US Army, he moved to New York to pursue a career in commercial art. But after showing his portfolio to one of the original editors at Golden Books, he found the perfect home for his children's books. The assignments first given to Scarry tended to be Little Golden Books that featured popular characters of the day, such as Winky Dink, Rudolph the Red-Nosed Reindeer, and Smokey the Bear. Eventually Scarry created many original characters, such as Lowly Worm and Huckle Cat. But first came Nicholas, a young rabbit clad in red overalls, for the now-iconic board book I Am a Bunny. After Scarry married children's textbook writer Patricia Murphy, she wrote many stories for him as Patsy Scarry, including the bestselling Little Golden Books Good Night, Little Bear and The Bunny Book. In his extraordinary career, Richard Scarry illustrated more than 150 books, many of which have never been out of print. His books have sold over 100 million copies around the world and are currently published in more than 20 languages. Richard Scarry Jr., also an illustrator, carries on his father's work today under the name of Huck Scarry. Richard Scarry passed away at his home in Gstaad, Switzerland, in 1994. He was posthumously awarded a Lifetime Achievement Award from the Society of Illustrators in 2012. I'm the author/artist and I want to review Best Little Word Book Ever!.